How a village grows: This lesson tells you how a village grows through the information about an old village called Bradford which grew into a large city later. Bradford is a large city in British Isles, which is a very good example to learn about how a village grows. 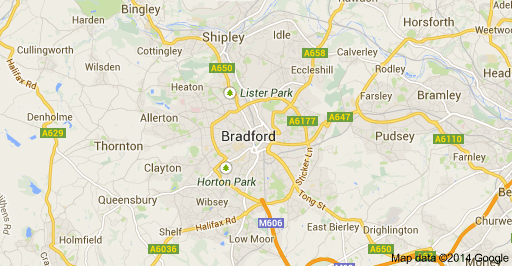 Bradford is located in West Yorkshire in Northern England. What is the population of Bradford? The population of Bradford is about 490 000. Saxons were members of Germanic people who conquered England. How was Bradford like in Saxon times? Bradford was a small village in Saxon times. It was then called ‘Broad Ford’. Why it was then called ‘Broad Ford’? It was then called Broad Ford , because the village was where the local rivers could be crossed on foot. When had Bradford grown into a small town? Bradford had grown into a small town by the Middle Ages. This shows clearly how a village grows first into small towns and then into large towns. What is meant by ‘Middle Ages’? The period of Middle Ages is the time between the ancient and modern time. How did the people in Bradford earn their living in the Middle Ages? Local people spun and wove the wool into cloth in their homes. Later people began to build factories for making woollen cloth. Why was Bradford a good place to build woollen factories? Locations which best suit for building factories influence a lot in how a village grows. It had plenty of wool. It had fast flowing rivers (one of the main factors that affects how a village grows) to turn waterwheels that powered the weaving machines. There were mines nearby (one of the main factors that affects how a village grows) to produce coal to heat the boilers. There were rivers nearby (one of the main factors that affects how a village grows) to get water to make the steam for steam engines. What were the features which made Bradford a city? Here you can learn some of the features which affect how a village grows. Coming of the railways. The railway linked Bradford to other parts of Britain. Many people came from all over the British Isles to work in the woollen mills. Many fine buildings were put up in the town centre. Thousands of small back-to-back terraced houses were built for the mill workers. When did Bradford become the centre of the world’s wool trade? Bradford became the centre of the world’s wool trade by 1850. When did Bradford become a city? Bradford became a city in 1897. When did the Bradford Canal open? Bradford canal opened in 1774. How did people use the Bradford canal? It was the main means (ways) of transporting the city products in Bradford until the coming of the railway. When did the Bradford canal close? Bradford canal closed in 1922. Why was the Bradford canal closed? Bradford canal was closed because, the canal was filled in to make way for new roads. When did the value of the woollen industry in Bradford go down? During the second half of the 20th century the woollen industry in Bradford declined. How did the value of the woollen industry in Bradford go down? Cloth could be made more cheaply in other parts of the world. There was less demand for woollen cloth, so factories closed. What were the changes took place after closing the woollen factories? Following are some changes to show how a village grows. New industries grew up in Bradford such as engineering, chemical works, banking and finance. The old back-to-back houses were cleared away and new modern houses were built. Some of the old mill buildings were turned into offices, flats, museums and art galleries. 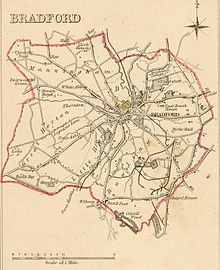 Why did people move on to the edges of Bradford from the centre of it? Following are some more changes to show how a village grows. New housing estates were built on the edges of Bradford. The city was linked by motorways to other parts of Britain. The city shares a modern airport with the neighbouring city of Leeds. Also, try the quizzes ‘How a village grows Quiz 1‘ and ‘How a village grows Quiz 2‘.